Softening behavior of concrete – decreasing strains with increasing stresses – in the tensile range is approximated by a multilinear approach, see softening range or Figure. The strength – highest reachable stress – of the multilinear approach is given through the tensile strength. The critical strain – when stress comes to zero – is ruled through the crack energy, see, e.g., Book 2.1. 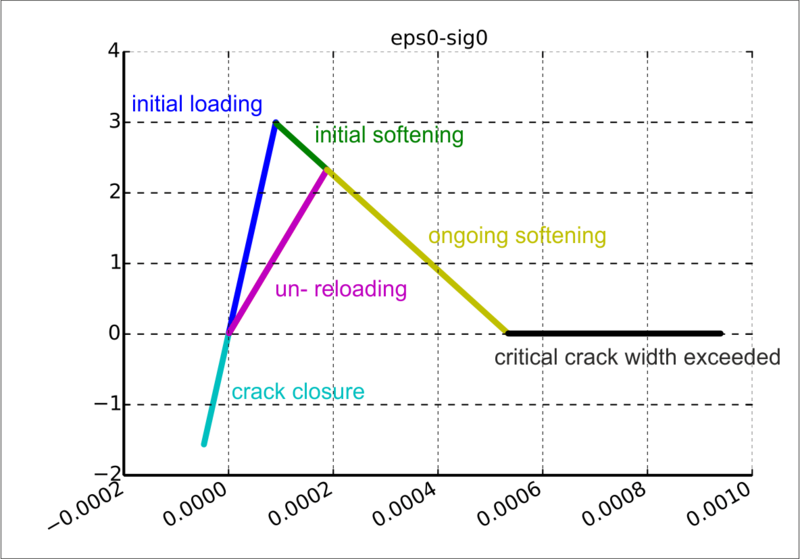 The strain in the softening range is strongly related to the crack width of the fictitious crack, see Book 5.7.1. The multilinear approach has some nice features. It is relatively easy to formulate, especially when loading–unloading effects and biaxial cracking have to be regarded. On the other hand the kink effect might occur with the transition from uncracked to cracked softening, switching between loading and unloading during softening, transition of critical crack width and others. It should be smoothed according to the previous post. This may be directly formulated by introducing transition curves between linear branches. There are a number. I refrained from dealing with each. It looked tedious, especially in a biaxial setup. introducing the rate of the fictitious crack width and an artificial viscosity parameter μ. 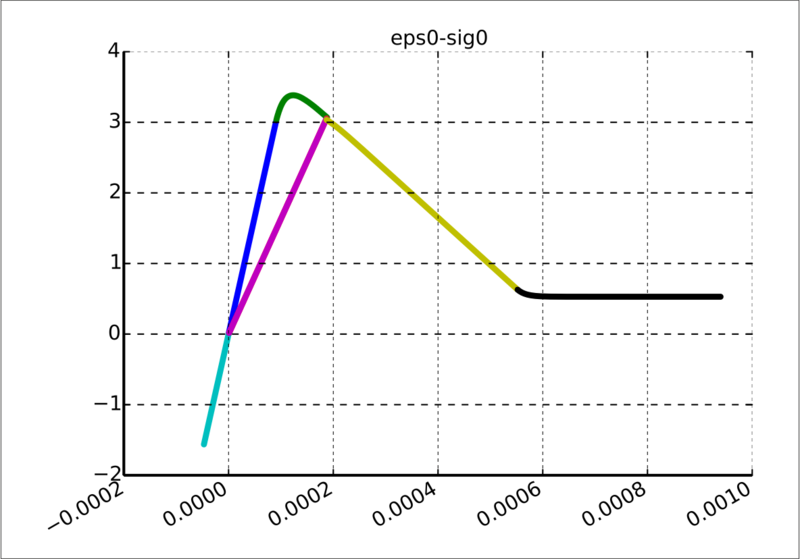 This should correspond to dynamic relaxation – performed on the material level. What might this practically mean? 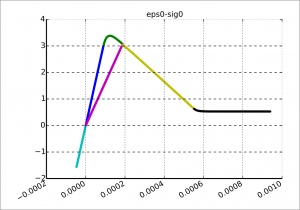 Compare the Figure for the uniaxial behavior without viscosity to the Figure with viscosity. We see some smoothing in the transition ranges from uncracked to cracked and when crossing the critical crack width. It is not obvious in the softening loading – unloading transition. It seems to be rather small there. One has to see. Anyway, in the end the displacements should rest and the value of μ should have no influence in the end. Viscosity serves to reach convergence within the equilibrium iterations only. Nevertheless, a value has to be chosen. I have to admit that this currently is done on a trial and error basis again. So what about the results? To be continued, stay tuned.